The following counsel to the church was presented Sunday evening by President Stephen M. Veazey. Every day since being ordained as prophet-president, I have carried the needs of the church on my heart. Sometimes the weight of concern has seemed almost unbearable. Perhaps this is as it should be, because the heaviness of responsibility has pressed me to seek the mind and will of God as never before. Striving to be open to the guidance of the Spirit, while attempting to lay aside my own preconceived notions, has been a challenging but necessary learning experience. And, as I have sought to perceive God’s will for the church through prayer, study, and listening for the Creator’s voice in the voices of the faith community, I have been blessed by the Spirit in various, sometimes surprising ways. The words and images that follow have been birthed through much struggle, not because of any lack of inspiration, but because of the limitations of the human vessel entrusted with responsibility for articulating divine encounter. Attempting to communicate in words what is ultimately beyond words always leaves one with a sense of incompleteness. Added to this is the challenge of creating phrases that can be translated into the languages of the international church without loss of essential meanings. Fortunately, we have the promise that one of the primary functions of the Holy Spirit is to bear witness of divine truth beyond the confines of language and culture. Therefore, it is in deep humility and with heartfelt gratitude to God that I offer the following counsel as a witness of God’s eternal purpose and continuing activity in the life of the church. In so doing, I place these words in the church’s hand, trusting that the Spirit will enable the faith community to hear the call of God today with increasing clarity. I present this counsel with no particular determination in mind at this time regarding its ultimate status. While fully aware of my responsibility and prerogative as prophet-president, I genuinely desire to discern with the church regarding this matter as we continue to explore together what it means to be a prophetic people. The Council of Twelve is urged to enthusiastically embrace its calling as apostles of the peace of Jesus Christ in all of its dimensions. The Twelve are sent into the world to lead the church’s mission of restoration through relevant gospel proclamation and the establishment of signal communities of justice and peace that reflect the vision of Christ. As the apostles move out in faith and unity of purpose, freeing themselves from other duties, they will be blessed with an increased capacity for sharing Christ’s message of hope and restoration for creation. To accelerate the work of sharing the gospel, the Twelve and the Seventy should be closely associated in implementing wholistic evangelistic ministries. The seventy are to be the forerunners of Christ’s peace, preparing the way for apostolic witness to be more readily received. Procedures regarding the calling and assignments of the Presidents of Seventy and members of the Quorums of Seventy shall be developed to facilitate the maximum level of collaboration with the Council of Twelve. The Twelve, the Presidents of Seventy, and the Quorums of Seventy should spend sufficient time together to ensure a mutual understanding of evangelistic priorities and approaches. Priesthood is a sacred covenant involving the highest form of stewardship of body, mind, spirit, and relationships. The priesthood shall be composed of people of humility and integrity who are willing to extend themselves in service for others and for the well-being of the faith community. Truly authoritative priesthood ministry emerges from a growing capacity to bring blessing to others. Unfortunately, there are some who have chosen to view priesthood as a right of privilege or as a platform for promoting personal perspectives. Others hold priesthood as a casual aspect of their lives without regard to appropriate levels of preparation and response. The expectation for priesthood to continually magnify their callings through spiritual growth, study, exemplary generosity, ethical choices, and fully accountable ministry is always present. How can the Spirit fill vessels that are unwilling to expand their capacity to receive and give according to a full measure of God’s grace and truth? Counsel given previously regarding the need to develop ways whereby priesthood can magnify their ministry or determine their commitment to active service remains applicable and should be more intentionally implemented. The First Presidency will provide guidelines for processes to be applied in culturally respectful ways in the various fields of the church. Fundamentally, however, the ultimate responsibility for priesthood faithfulness rests on the individual in response to the needs and expectations of the faith community. Scripture is an indispensable witness to the Eternal Source of light and truth, which cannot be fully contained in any finite vessel or language. Scripture has been written and shaped by human authors through experiences of revelation and ongoing inspiration of the Holy Spirit in the midst of time and culture. Scripture is not to be worshiped or idolized. Only God, the Eternal One of whom scripture testifies, is worthy of worship. God’s nature, as revealed in Jesus Christ and affirmed by the Holy Spirit, provides the ultimate standard by which any portion of scripture should be interpreted and applied. It is not pleasing to God when any passage of scripture is used to diminish or oppress races, genders, or classes of human beings. Much physical and emotional violence has been done to some of God’s beloved children through the misuse of scripture. The church is called to confess and repent of such attitudes and practices. Scripture, prophetic guidance, knowledge, and discernment in the faith community must walk hand in hand to reveal the true will of God. Follow this pathway, which is the way of the Living Christ, and you will discover more than sufficient light for the journey ahead. 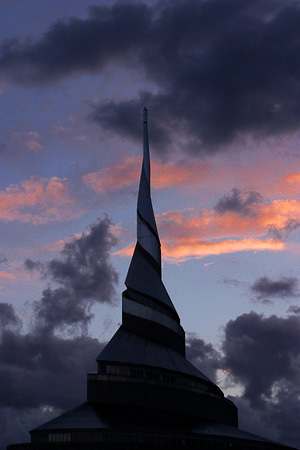 The Temple is an instrument of ongoing revelation in the life of the church. Its symbolism and ministries call people to reverence in the presence of the Divine Being. Transformative encounters with the Eternal Creator and Reconciler await those who follow its spiritual pathways of healing, reconciliation, peace, strengthening of faith, and knowledge. There are additional sacred ministries that will spring forth from the Temple as rivers of living water to help people soothe and resolve the brokenness and pain in their lives. Let the Temple continue to come to life as a sacred center of worship, education, community building, and discipleship preparation for all ages. As these ministries come to fuller expression, receptive congregations in the areas around the Temple and throughout the world will be revived and equipped for more effective ministry. Vital to this awakening is the understanding that the Temple calls the entire church to become a sanctuary of Christ’s peace, where people from all nations, ethnicities, and life circumstances can be gathered into a spiritual home without dividing walls, as a fulfillment of the vision for which Jesus Christ sacrificed his life. Faithful disciples respond to an increasing awareness of the abundant generosity of God by sharing according to the desires of their hearts; not by commandment or constraint. Break free of the shackles of conventional culture that mainly promote self-serving interests. Give generously according to your true capacity. Eternal joy and peace await those who grow in the grace of generosity that flows from compassionate hearts without thought of return. Could it be otherwise in the domain of God, who eternally gives all for the sake of creation? Do not turn away in pride, fear, or guilt from the One who seeks only the best for you and your loved ones. Come before your Eternal Creator with open minds and hearts and discover the blessings of the gospel anew. Be vulnerable to divine grace. There are many issues that could easily consume the time and energy of the church. However, the challenge before a prophetic people is to discern and pursue what matters most for the journey ahead. In addition to the words offered above, I want to express my heartfelt love for the church as it is and as it is becoming. Despite the challenges involved, it is my pleasure to be able to serve you, my brothers and sisters in Christ, who have been claimed by the adventurous vision and spirit of the Restoration movement. May we journey into the future trusting one another, confident that the One who called the church into being continues to guide it toward fulfillment of divine purpose.